I don't know if you have noticed that I like bulgur, different types of bulgur, and anything with bulgur. I like bulgur especially in kofte form such as this, this, and this. 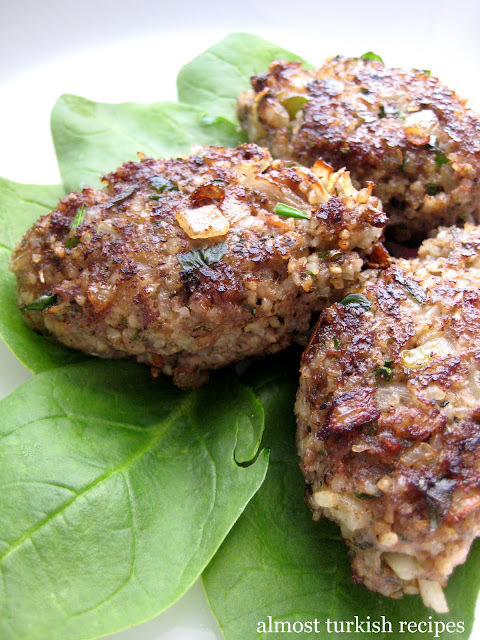 Bulgur kofte is yet another bulgur dish in kofte form. The recipe belongs to my mom and has long been a family favorite. Bulgur gives a nice, nutty flavor to otherwise a regular kofte recipe. We usually enjoy it during summer days since it is lighter than 100% meat recipes and delicious when grilled. Although I have a copy of Ayla Algar's Classical Turkish Cooking, I hadn't noticed before that Algar has a similar recipe to my mom's bulgur kofte recipe. The following is a combination of both. -Place bulgur in a bowl. Pour hot water on top to barely cover it. Let stand for 15 minutes to soak. -Add the rest of the ingredients. Salt to your taste. -Take pieces little bigger than walnuts and shape into oval patties. -Either grill until both sides are crispy or cook them in a lightly oiled pan on both sides. Loving it! How do you normally eat this? Thank you. I can tell I would love this! I sometimes add bulgur to my falafels as well and love the nuttiness and texture. These sound so delicious, I better get cracking!! elra, you can eat it with pilaf, any kind of pilaf-rice, bulgur, couscous, ect-on the side or with salad or in a sandwich, in short, eat it in any way you would eat regular meatballs. Wow, It's like a new breed of meat ball. It looks very good. The ingredients are good also. Ordinary spices from your spice rack are used and you don't have to look for it anywhere. 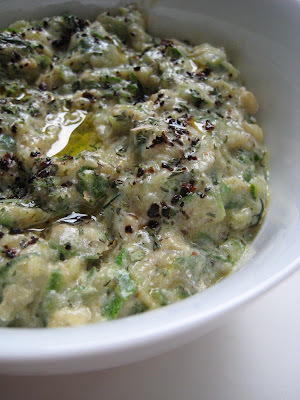 Perfect for lunch or dinner with vegetable dressings and some spicy sauce. Made this last weekend and loved it! it was quick, easy and tasted great. 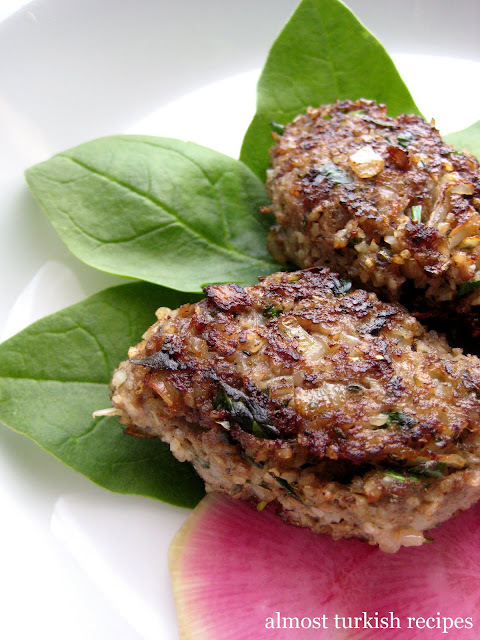 In Lebanon we call these kibbeh; love yours they look so juicy and delicious! I need to make some soon! Elana, Thanks for the feedback. I'm glad you liked them. tasteofbeirut--I thought kibbeh was groundmeat, walnut, spices, etc. inside and a bulgur shell outside. This looks like a slightly different version of meat balls. I love it! Yum! It is somewhere between 1/2 cup to 1 cup. I made this with lamb and using couscous because i couldnt find bulgur. oh man this is tasty tasty food. definately going to make again. my Turkish neigbour was very impressed :) thanks. Simon. Pinar, I'm sorry to respond late, and I guess you can make it with 4%. The reason why I use 80% is because meatballs are way more delicious with fatty meat. I think the first time we tried bulgar, it was a recipe from your blog, but it's been a while. This sounds so delicious! The photo's make these look so appetizing. I don't eat meat, so I'm wondering what to add to the Bulgar to make these, and they'll still be delicious. May lentils. I'm going to try. can i use any size of bulgur? Medium grind or fine grind? I wonder if I can use this recipe to do some other kofte dishes in the oven? Do you think there is any tweaks needed on the recipe if you want to make a kofte with patotoes (with tomato sauce and peppers)dish, you know, the traditional turkish dish. ps. my wife and I both are addicted to your blog here in the states. Thanks for the hard and delicious work. i never tried bulgur kofte in a traditional firinda kofte recipe, but I don't see any reason why it wouldn't work. Yet, since bulgur kofte has a looser texture than just meat kofte, I would recommend cooking koftes on both sides for a min or so in a frying pan with little oil. And thanks for your nice comments. I just make it to my B.day party! wow! loved the idea. will definitely try them. I am always looking for tasty and nutritious food for my kids lunchbox! can these be freezed before or after cooking? I do freeze them before cooking on parchement paper first then store in a bag. Never tried making these before, looks like a delicious recipe. Thanks for sharing. Is the 2 tbsp olive oil to add to the mixture or to fry with please? They look yummy, I will await your answer and try them. Thanks in advance.